Support our graduate students at this year's Grad Slam! Up to two audience choice winners from each round advance to next week's semi-finals, and the chance to win up to $5000 for their research. 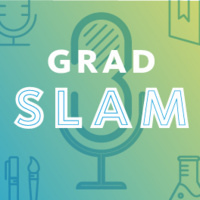 Grad Slam is an annual UC-wide public speaking competition in which graduate students must describe their research and its value in 3 minutes, with limited visual aids, in order to potentially win funding for their work.